Diadem pendant. Gold, fine pearl and glass beads, Greek artwork, 3rd-2nd century BC. Gold and silver jewelry, 8th-3rd century BC. Ashmolean Museum, Oxford. 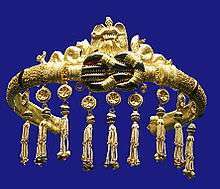 Ancient greek earring found in the anfitheatre of Cartagena (Spain). II century b.C. Archaelogical Museum of Cartagena (Spain). 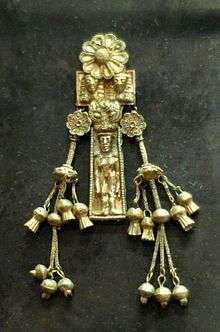 Pendant representing a naked woman. Electrum, made by a Rhodian workshop, ca. 630-620 BC. Found in the necropolis of Kameiros (Rhodes).